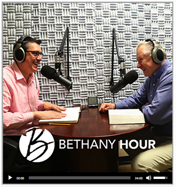 The Media Ministry is responsible for most of the multimedia products associated with Bethany, which includes video production of the weekly video announcements (BNN) or “Bethany News Network”, as well as other video productions. 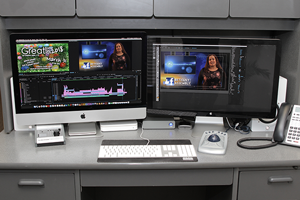 Using professional grade HD video cameras and audio recording devices, and edited using a nonlinear digital editing suite, we produce professional videos of classes, testimonies, advertisements, and social media promotions. 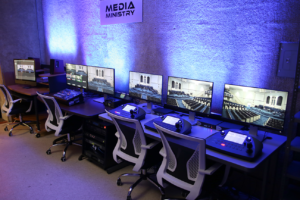 The Media Ministry is also responsible for projecting the BNN, worship song lyrics, messages, and any other special or informational videos on to the large screens during services. These presentations are controlled within the Media Booth located in the sanctuary’s balcony, and is full of sophisticated multimedia equipment. Presentation technicians control the projection of the song lyrics, scripture messages, graphics, photos and videos played during the services, as well as the spot and house lights. Within this ministry, the video production team controls three remote HD video cameras located within the sanctuary during the Sunday 9:00 am and 11 am services, taking commands from the video director who assembles the footage from these cameras, into live edited productions. These live productions are recorded to a computer’s hard drive and also live streamed over the internet on the Bethany website, as well as on FaceBook Live. 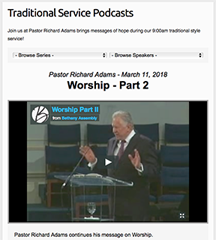 The hard drive video recordings of the services are uploaded to Bethany’s website, located under the “Media” section dropdown, for anyone to watch at a later date. Sam Adams is responsible for producing audio Podcasts of the Bethany Hour, the contemporary services and other audio recordings. Using state-of-the-art soundboards, microphones, amps, speakers and other equipment, the audio technicians constantly make adjustments during every service, both in the sanctuary Media Booth and in the Media Center, to make sure your audio experience at Bethany is a pleasant one. Many of the churches graphic design and photography work is done within the Media Ministry, using professional computer graphic design software and professional grade digital still cameras to produce stunning and eye-catching products and photographs. Lastly, the Media Ministry is also responsible for populating and maintaining the Bethany website and all social media venues. 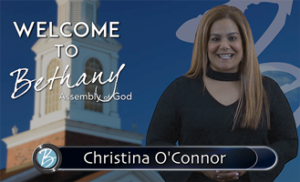 Bethany is increasing it’s use of this media to share church events, news and other important information with current church members, visitors and first time guests. Please connect with us, and share with your friends. 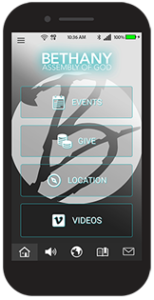 The Media Ministry is also responsible for maintaining the Bethany App. Download it today. The Media Ministry is always looking for volunteers to assist with services and projects. This ministry is only effective because of the volunteers who are engaged and serving. If you already have some aspect of media experience, or are willing to be trained, it’s a great teamwork oriented environment to get involved within the church, serve the Lord, and meet new people. If you're interested in serving the Lord by using media to help share the Word, and bring more people to Christ, please contact the Media Director, ask someone at the Hospitality Counter, or complete a volunteer form.